Online or by phone (877.987.6487). Additional fees apply. 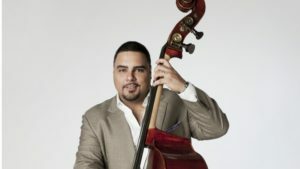 With a high-energy tribute to the Latin jazz legacy of trumpet legend and bebop pioneer John Birks “Dizzy” Gillespie, Bronx-born bassist, composer, and longtime Jazz at Lincoln Center Orchestra veteran Carlos Henriquez performs with his ace nonet.